So many times when seeing a car parked next to a fixed object, getting pictures from all angles is tough. Such isn’t the case here, since this thoughtful owner has two examples, parked in an opposite fashion. 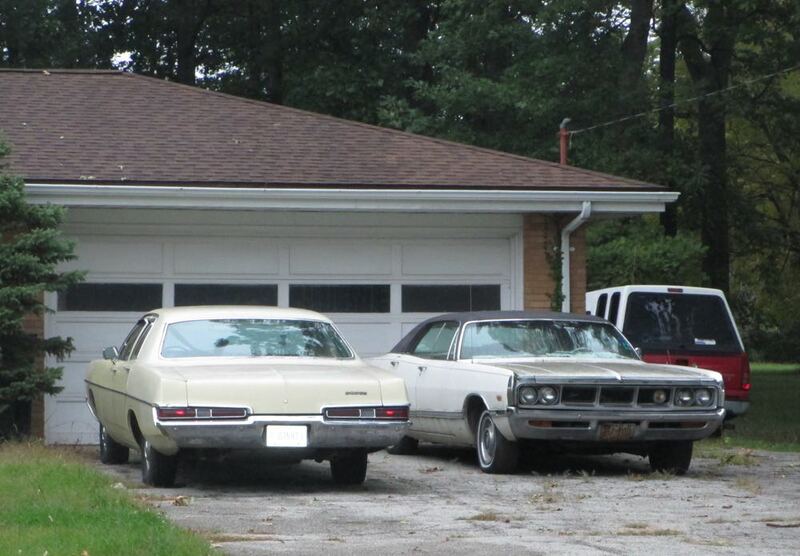 If a person wants to get ridiculously technical about it, the one facing the garage is a Polara and the other is a Monaco. Like it really matters – both are C-body Dodges and seeing one at all is a major conquest. 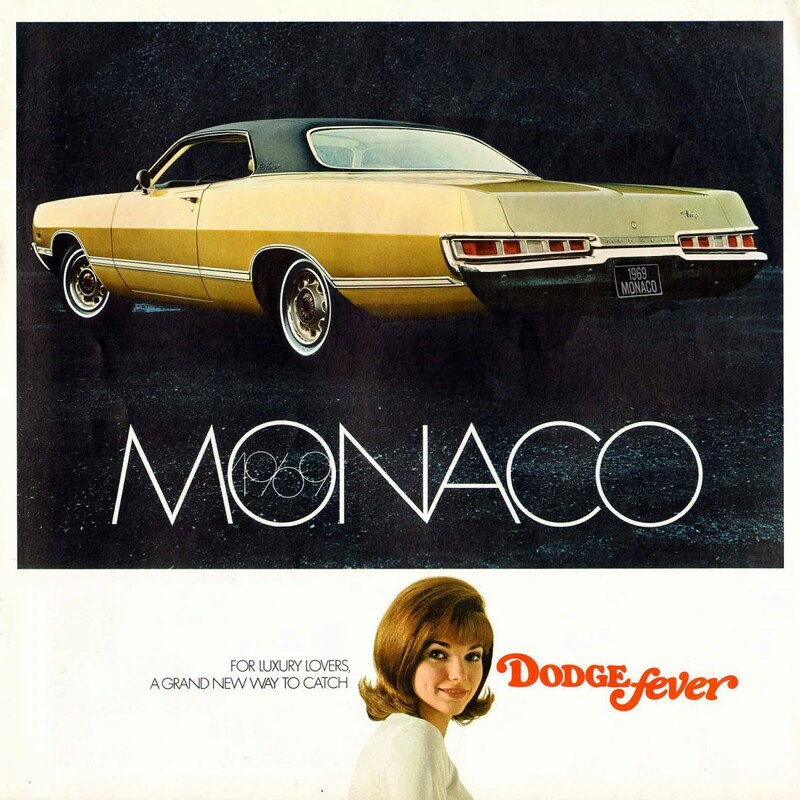 The Monaco, the name for the upper-tier big Dodge, had been around since 1965. Just keep in mind there is no such thing as a stripped-down version of this car. However, that statement is arguable since Chrysler still had a three-speed manual transmission (column mounted, naturally) as standard equipment on the Monaco. Since I couldn’t get closer, this is probably one of the roughly five built with the three-on-the-tree. On the positive side, the Monaco did have a four-barrel 383 (6.3 liter) as standard motivation, with a 440 (7.2 liter) optional. This Monaco even has the optional Super-Lite as well as the chrome extending onto the lip of the hood. No, the light wasn’t on; that illuminated look is called good fortune caused by outhouse luck. The Polara is the more ordinary sedan and Dodge never made any claims about a stripper version being unavailable. It was also more popular as over 88,000 were built, about two and one-half times the number of Monaco’s that rolled out the factory door. Mechanically, the Polara had a 318 (5.2 liter) as standard fare, also backed by the standard three-speed with the Torqueflite being optional. 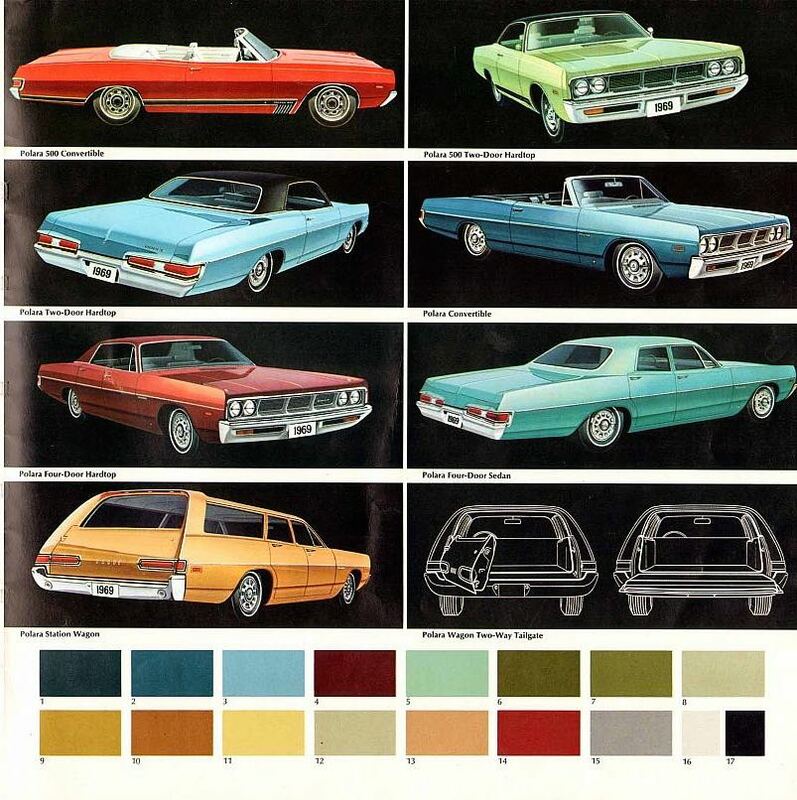 With seventeen available colors, the Polara had every body style available on the Monaco plus one – all convertibles wore the Polara nameplate. Did you see the cute brunette at the bottom of the Monaco ad? Her name is Joan Parker and at age 23 she was a fixture in Dodge commercials during 1968 and 1969. Here she is talking about a 1969 Polara White Hat Special. Known as the “Dodge Fever” girl, she’s seen here talking about the Monaco. 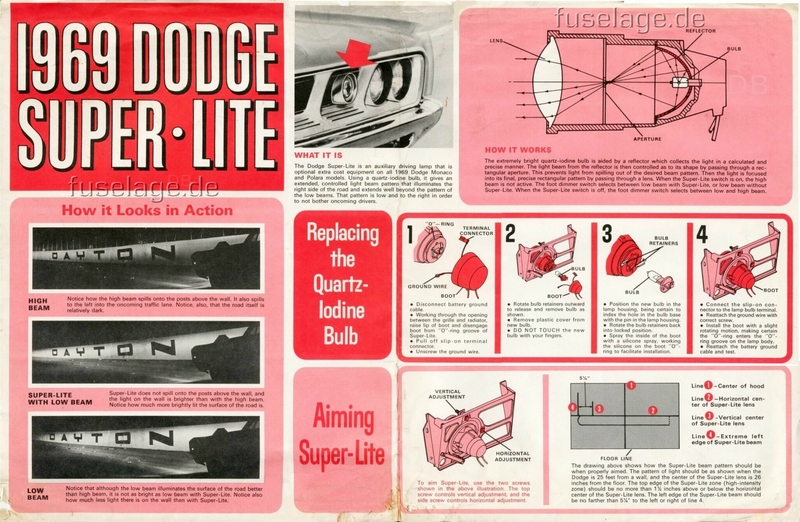 Dodge advertising also had the “Material Girl” and “Rebellion Girl”. Perhaps one of the bigger claims to fame for the 1969 Polara is for those who were overly rebellious. 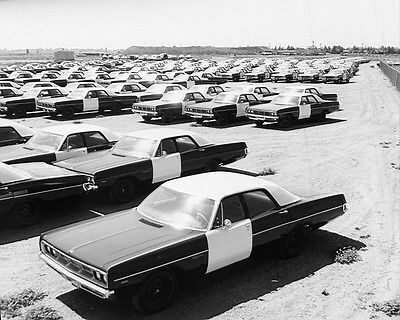 Over 1,300 Polaras were purchased by the California Highway Patrol. Equipped with a 440 (what else?) one was clocked at 147 mph during testing. It looks like all of them are parked here awaiting lights and decals, awaiting their time to deal with various rebellious persons throughout California. Oddly, these were found in Studebaker Land, on Indiana Route 2 just west of South Bend. There’s a rebel in every crowd. Glad to see these on CC, Jason. Our family had a “leftover” dark blue ’69 Monaco in 1970 (Dad was a great bargain hunter) and it was a wonderful car. Even though it was equipped with the 383 and not the mighty 440, I can personally attest that it was pretty fast for a big car. It was the first car I ever pushed to an indicated 100 m.p.h. and this on my newly minted driver’s license. It was also the first car I ever got airborne on whoop-de-doos on the Grand Central Parkway in New York City, or so it seemed at the time. Might have just been extreme unloading of the suspension due to massive negative G’s, but who’s counting? It put up with 100,000 miles of this kind of abuse from me, Dad’s daily commute in NYC rush hour traffic and annual out-of-town Summer vacations with nary a complaint and only minor repairs. P.S. It had genuine brocade upholstery, too. fastest police car for decades until the ’90s LT1 Caprices. Nope. 9C1 Caprices were speed limited to 130 or 143 mph, depending on the tires. The 1969 Dodge Polara 440 police car held the top spot for fastest police sedan until the 2006 Charger beat it with 150 mph, which I believe is still the fastest top speed for a police sedan. Aussie Ford Falcon XY 71 police spec 162 mph. Owned a ’69 Polara two door hard top, white with a black vinyl top and a white and black interior. 318 powered, with 33K- inherited from my great-grandmother. Built in August of ’68, bought new in July of ’70. No one else in the family wanted it when she passed and I enjoyed it thoroughly. Unfortunately, life circumstances dictataed that I needed to sell it after 4 years and it still pains me that I had to do so, years later. I still hope that it will turn up on craigslist, but I know it won’t. Here’s the ad for the Super-Lite option. It was an extra $50 for this lite and not a lot of people took them up on it. ETA: Ooo! Ooo! Apparently Sylvania manufactured the bulbs for the Super-Lite. If I recall correctly, the SuperLite wasn’t legal for sale in some states either, limiting its take rate. The center grille ornament on the 1965 Chrysler 300L lit-up. In some states that was illegal, so dealers were instructed to disconnect it from the wiring harness. Probably the same places where the SuperLite was outlawed. Wouldn’t it be great if the sedan was a six-cylinder, 3-on-the-tree? With the Super-Lite car, that would be a couple of rare ’69 Polaras, indeed. General Telephone was our terrible local phone company back then. Looks like an H1 bulb in the drawing but the tab is bent up. Before I bought my 96 Odyssey (maybe 2008-ish?) I was trying to buy a 71 Polara sedan. It was a very clean, low mile car, gold with black vinyl top and interior, and a 360. Problem was that a windstorm had done some damage to the car, including a windshield. I thought that I might finally become a fuselage owner, but alas, the seller and I could not get together on price. I have never forgotten that car, and still find the 69-71 Polara and Monaco to be really attractive cars. 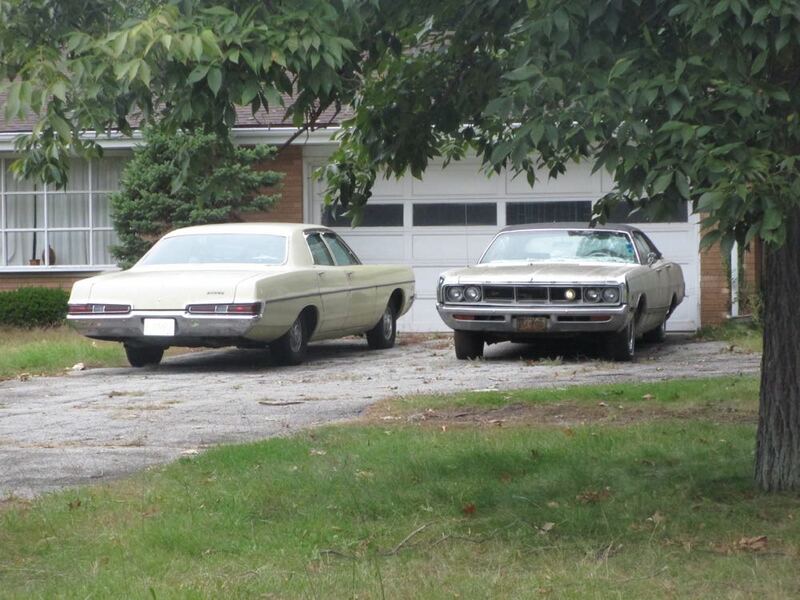 I think these are the same beige as my 68 Newport was, a color that I think made up 46% of Mopar production (with green being 50% and every other color making up the remaining 4%). Those windshields are getting pretty expensive (discontinued in the aftermarket). I’ve though about getting a spare one to have around, just in case- but for the price they are going for, it’s almost worth just waiting until a parts car comes along at the local u-pull it with good glass. That was what I suspected. The owner gave me the “I’ll knock $150 off for the windshield” bit. I responded with “You fix the windshield and I will pay $150 more”, figuring that if a windshield was really $150, he would have had it done already, and probably under insurance. I was still open to discussing it, and went so far as to call a couple of glass companies who made it sound like finding one was going to be a pain. A deal killed by too many obstacles. Yeah, that’s the old ‘it’s an easy and cheap fix’ routine for anything that’s wrong with a car. If it was that easy and cheap to fix, why didn’t they do it before putting it up for sale? People normally don’t sell a car where everything’s working fine; they only want to sell when something’s wrong and it’s going to be more of a headache to fix than it’s worth (despite what they may say to any prospective buyer). My grandmother’s neighbors had a 1969 Monaco hardtop sedan in medium green with a black vinyl roof. They bought it brand-new, and, if I recall correctly, it even had the Super-Lite option. 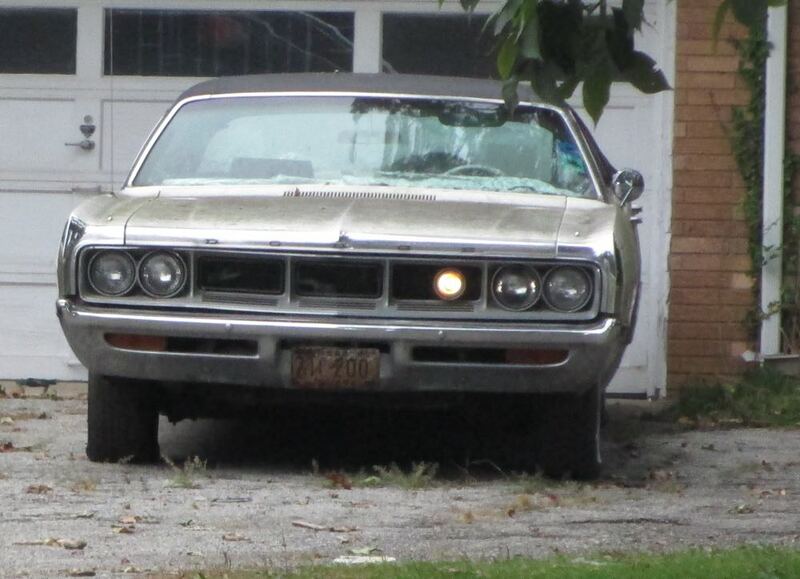 That Dodge sat parked along the street for many years, slowly deteriorating, until it disappeared in the mid-1980s. On the 1969 C-bodies, the rear track is too narrow. At this year’s Chryslers at Carlisle Show, I watched a 1969 Polara drive away, and the narrow rear track was painfully apparent when the car was looked at from behind. Customers complained about this, which is why Chrysler widened the rear track on the 1970 C-bodies. Jason, I have driven that road, just a couple of times, and I know the old car viewing there is good. I remember the Studebaker testing grounds out there as well as interesting cars parked, for sale and cruising. It’s understandable as the Studebaker dealer in downtown South Bend (not far from where the factory used to stand) was Freeman-Spicer, and they also sold Chrysler-Plymouth vehicles (as well as Mercedes-Benz). Even though these are Dodges, it wouldn’t be much of a stretch to think some sort of deal between Chrysler and Studebaker, probably through FS, had been worked to allow them to be stored there until final disposition. FWIW, although the dealership closed decades ago, I recently saw a sign in town for Freeman-Spicer financial services, and you can actually still buy Freeman-Spicer dealership car stickers at the Studebaker museum to really make your restoration of an old, South Bend-area Studebaker/Mercedes/Chrysler-Plymouth complete. You’re treated nicer at Freeman-Spicer. Or so said their newspaper ads when I was a kid. Yeah, but DL Miller had the better radio jingle. The proving grounds popped out at me, but I didn’t make the correlation at first. It was full of International trucks of all ages and varieties since Navistar now appears to own it. The economics at Chrysler are always interesting. By 1967, the A and B body Mopars shared most things but nameplates. And the As sold in large and increasing numbers. While the C bodies sold at higher price points, there is a lot of unique tooling here for sheet metal, interior bits, dash, etc., for about 125,000 cars. The wagon tailgate fitted with the trapezoid lights is automotive unobtanium today. I don’t believe I’ve ever seen the side trim on the 500 coupe and convertible – but it is sharp looking. It would be interesting to know how the internal cost accountants viewed these cars. With all the variety that these cars came in, it’s a bit amazing that you couldn’t get the convertible in Monaco trim. While it would not likely have made much difference, it would make more sense to me to have offered the ‘vert as a Monaco if you were going to go with one trim. I rather like the ’69 big Dodges, its a shame they didn’t sell better. They seemed to share the same Purgatory with big Pontiacs – handsome cars that had a progressively harder time finding sales. Interestingly enough Dave, in Canada there were two Monaco convertibles available for 1969. One was essentially the US market Polara 500, rebadged as a Monaco 500. The other was a true Monaco, having no US equivalent. Makes your points about costs and variations even more valid! I’m always amazed at the variety of unique parts, especially nearly but not quite identical interior and trim parts, they made for C-bodies. I always have to be cognizant of this when looking for replacement parts for my restoration. Of course, very few of these parts have been reproduced by the aftermarket, unless they happened to be shared by an A/B/E-body. 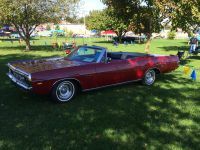 To make things more interesting, a 1969 Monaco convertible WAS available in Canada. EDIT: Jimmy beat me to it! I’ve always presumed that the available chromed front cap was supposed to be a precursor to the loop bumper that the Monaco/Polara would be sporting in 1970. I think the ’69s look better without it. I find it strange then the Monaco was availble with a convertible version in the Great White North and they was also available with smaller engines like the 318 ci V8 and even the slant-6. The chromed front cap was a mid-year addition until the true loop bumper will be ready for 1970. Like what? Engines and transmissions, yes, but the Cs had those too. I was wondering what was implied by that statement as well. As far as I know, none of the major suspension parts are interchangeable between A/B/C-bodies. While the 8-3/4″ diff was available in all, the rear axle was narrower in A-bodies than in the others. Poorly written on my part. The compact As, Valiant / Dart were mostly the same, and the mid-size Bs, Satellite / Coronet were mostly the same. I dare say the Dodge Fever Girl was a better sight to see on Dodge commercials then Don Knotts trying to hock D Series pickup trucks. Here’s Barney extolling the virtues of the all-new ’71 “Strongbox” Tradesman van…. As for me, I’m more of a Cheryl Miller fan…. How old is the Fat Hick Sheriff trope (Challenger ad)? It didn’t start with Jackie Gleason, apparently. Joe Higgins, Dodge Safety Sheriff! Joe Higgns reprised his role for the 1972 Dodge Monaco with Lee Trevino. Here one commercial featuring the 1971 Polara with Allan Melvin & Rick Hurst to promote Chrysler’s AirTemp. Clifton James played Sheriff Pepper in the two Bond pictures. – When I was about 12 my neighbor across the street had a two door as his first car, it was rusty and he fixed the rear quarters with pop riveted replacements. I was astounded at how many rivets it took to get from the back edge of the door to the rear bumper. I rode in it once, he took his younger brother and other kids on the street to see “Herbie Goes Bananas” so it must have been 1980. – In high school there was a 1969 four door sedan I walked by every day to and from school. It never moved, and I endlessly schemed about how I could bring it home and fix it up myself. “Really Mom and Dad, it’s not THAT enormous!” Like all my high school automotive scheming it came to nothing. 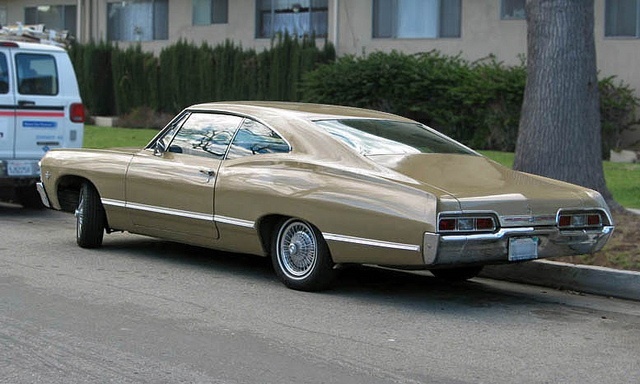 My dad’s 69 Monaco Brougham was the first car i drove (as opposed to being driven in) on a road trip, in 1971. That car had a lot of firsts for dad – first air conditioning, first power windows, first non-bench seat. It felt okay at 80 on the western Interstates (Dad was pretty calm about my driving, but said to hold things down to 80. One correction, the standard 383 in the Monaco had two barrels and produced 290 gross hp. Plenty of grunt for that big car. Absolutely love the look of Fuselage bodied 2 door hardtops. My aunt and uncle bought a ’70 Newport Custom new. What a car it was! By the time these Dodges hit the showroom the small town I lived in no longer had a Dodge dealership and the “local” Chrysler-Plymouth dealership was about a 10-15 minute drive, so needless to say these were no seen in my area except when driven by folks “just passing through”. As a consequence, I STRONGLY preferred the 69 Plymouths over the 69 Dodges, though the family of a high school classmate had a 69 Coronet 500 that I thought was a nice looking car. I wonder if Dodge saw the Monaco as a Caprice competitor, and that’s why the convertible was a Polara only body style? Yet it is odd that the SMALLER Canadian market got a Monaco convertible. 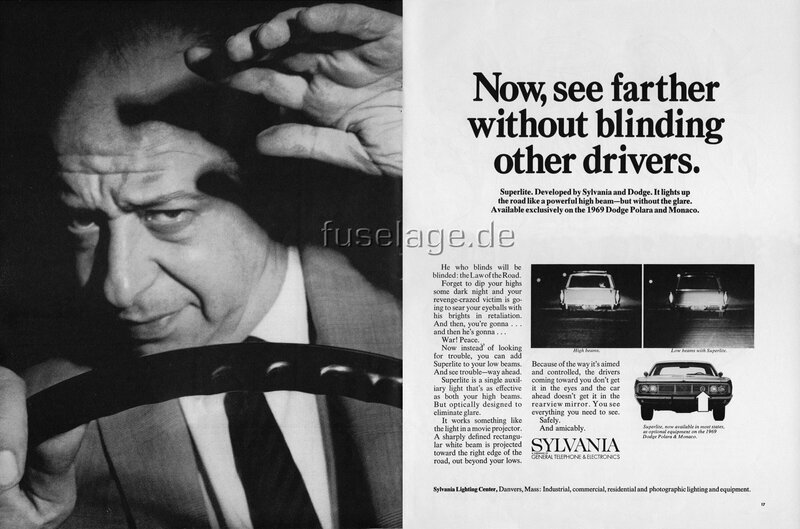 With all the different sizes and shapes of lights on cars nowadays, it’s hard to imagine a time when ONLY 2 or 4 round headlights were are that were legal. Auto historian Jeffrey Godshall in a Collectible Automobile article about the 1969-73 full-size Dodge said Dodge tried to chase Pontiac. But when they redesigned the 1972 front end (and giving hidden headlights to the Monaco), they seem to chase Mercury as well since the 1972 Monaco front seem to be more or less inspired from the 1970 Mercury. I know where a Dodge of this body style lives, in a bad neighborhood in Indy. If it weren’t on private property, I’d’ve photographed it and written it up by now. All white, hardtop sedan, no apparent rust, but hasn’t moved in four years. No friggin’ fair–I searched so long and hard for some good Fuseys and you go and find two. I still think they’re gorgeous in 4-door form. And in your state of Indiana, no less! Seeing these was a jaw-dropping moment, so I had to hit the brakes and turn around. First thing I think about when I see 1969 Dodge Monaco/Polara is the CHP 440 pursuit car! A big reason why the CHP and other LE agencies used Mopars for years and years. The biggest reason was likely that, back in the day, Chrysler products were the best engineered of the Big 3. For short-term, heavy-duty use where body integrity was of a lesser consideration, that rationale worked fine. But then the mid-to-late seventies hit, and Chrysler’s engineering spiraled downward to be no better than Ford or GM. Without that engineering edge, there simply wasn’t a reason to buy Chrysler police cars anymore. I remember during a fishing trip up on the Pit river in Nor Cal there was a new ’69 Dodge CHP car parked next to a powerhouse unattended. There was nobody around, so I peeked inside – other than getting arrested, how often do you get to look in a patrol car? I especially remember a large sticker on the dashboard admonishing not to operate the AC at speeds over 80mph. These were good looking cars. Great post, Jason. Joan Parker ad No. 1 is everything! From Joan herself and her upbeat delivery, to the giant Kodak slide projector, to the actual Dodge Fuseys, to the muzak version of “Do You Know The Way To San Jose?” playing in the background. I’m now going to be searching Amazon.com to look for a DVD of old car commercials. Thank you. I must admit to being a bit smitten with Joan while looking for commercials….she deserves her own post at some point. I tried googling Ms. Parker (and Pam Austin, the “Dodge Rebellion Girl” in 1966-67), but can’t find any current information. You’d think that a Mopar enthusiast would have tracked them down by this point. Both women, of course, are probably grandmothers by now. I found a Joan H. Parker, who is an author and currently 80 or so years old. Oddly, there was a mild resemblance, but the age was ten years off. Joan is now about 70, and she probably is a grandmother by now. There was an author named Joan Parker from Massachusetts who died at age 80 in 2013. It’s definitely not the same person. The Joan Parker in the Dodge ads had some bit parts in 1970s television shows, but that is about it. She was originally from upstate New York. Same goes for Cheryl “Dodge Material” Miller. though I did find a shot of Joan passing the White Hat to Cheryl. Prior to her “move” from Hollywood to Hamtramck, Cheryl was a regular on Daktari…. 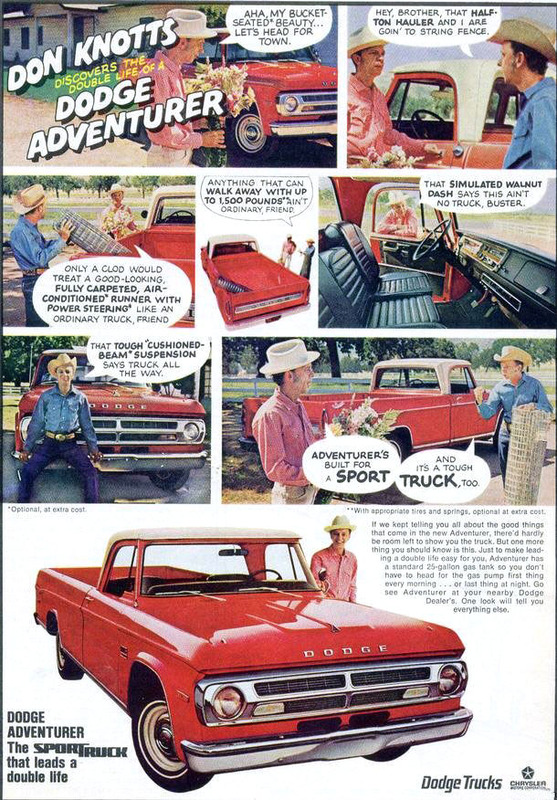 Full size Dodges didn’t seem to sell well to upper middle class buyers, after the hit 1960 model year. Possible reason for late 60’s/70’s low sales was the strong ‘muscle’ image led family car buyers to Chrysler-Plymouth dealers. * Newports and Furys sold well to “Ma and Dad” until the gas crisis, while Polara/Monacos sold well to Police fleets. The full-size Dodges never really recovered from the 1962 downsizing debacle. I believe that, throughout the rest of the 1960s, the Dodge was either the worst-selling, or second worst-selling (after the full-size Mercury), non-luxury full-size car. I’m pretty sure that even the Cadillac Calais/De Ville/Fleetwood was outselling the full-size Dodges by 1967. The ‘super lite’ is a pretty neat and interesting feature. I didnt even know about these, but this is the kind of little details that make a Mopar freak smile. nice car, I remember an old family friend had a ’72 Dodge Monaco 4 door that had a medium blue exterior and black vinyl top and I remember it being a very good car, I always felt these cars should’ve sold better than they did. Our neighbors had a 1972 Dodge Polara four-door sedan in gold with a black vinyl roof. I don’t remember them having major problems with it, but I always thought that the 1972 Polara was one of the ugliest cars of that year. The Polara and Monaco were both different kinds of ugly for 1972. I think that to the extent the Monaco actually looks good, it’s only when compared to the Polara. A college roommate had a 72 Polara wagon, in that awful butterscotch color. I’m not sure why I didn’t try to buy it from him. Great picture! Nice to see both of these cars, and you couldn’t have asked for better parking positions. These Dodges are my favorite of the “early” fuselage era (’69 – ’71), as the slight “Coke bottle” contouring and more fully exposed rear wheel openings made them look sleeker and less heavy. Those are great cars! They look better as 4 doors, in my opinion; the coupes seem to have odd proportions with those huuuuuuuuuge quarter panels. The 1969 Mopar C-bodies had the odd ignition switch on the left side of the steering wheel. About 5 years ago, I was looking for a low mileage classic Mopar sedan for a daily driver and came across a 50K mile 69 Polara sedan. It was a sharp car, dark blue with a white top and light blue interior and it had a 383. If it had a 440 and/or the Super-Lite, I might have picked it up but got a low mileage 72 Satellite instead. You can tell where the taillight design clearly came from… The 1967 Chevy Impala. 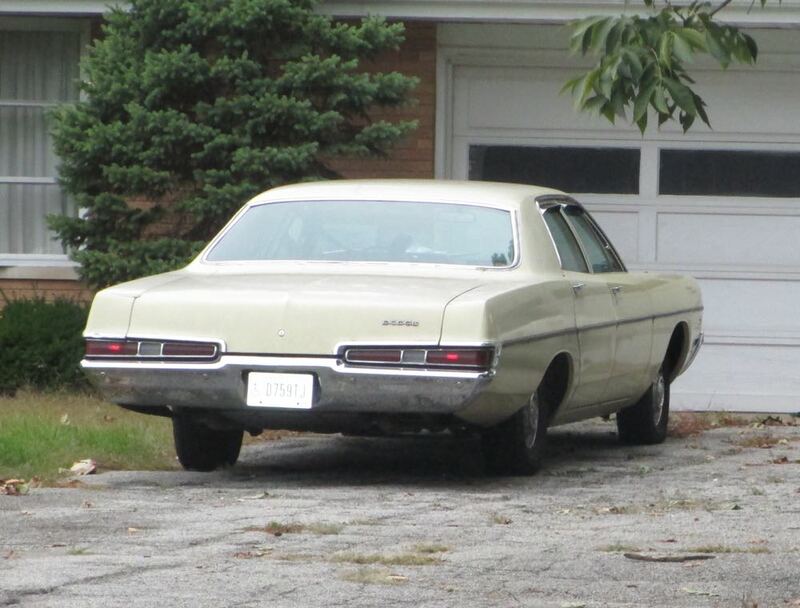 The rear end of the Polara looks more at home on a Chevy than a Dodge. Those fuselage Mopars are hands down my favorite domestic cars of the 20th century. My grandfather had a ’69 Newport hardtop sedan when I was about 4. He liked that car so much that if I remember correctly he held onto it until it was replaced by a new for ’75 Cordoba. I have such fond memories of trips to the Jersey shore every summer in that car. We’d pack everything but the kitchen sink into the trunk and I could still practically play tennis in that huge back seat. My most vivid memories of the Mopars of the late ’60’s and early ’70’s was the distinct whine of the starter inside the garage before the car would glide backward out the door. To this day I’d know the sound of a big old Chrysler starting up anywhere. Nothing like it. I remember an episode of CHIPS where a disgruntled laid off auto worker (Charles Napier) has a really mint ’69 Monaco 2 door hardtop, which he uses to run imports off the road, believing that they are responsible for the loss of his job. I like the Polara better than the Monaco, and the reason is highlighted in the back/front two cars. That Monaco has the chrome molding surrounding the grille which was at first optional, then I think became standard mid-year. It just doesn’t look as good as the Polara (and Plymouth Fury) that doesn’t have it. Nice, and rare, find! Fuselage mopars are certainly a rarity–I don’t think I’ve seen two together since about 10 years ago. The neighborhood I lived in during the end of college, and for a couple years after, featured a house with two fuselage Plymouths sharing a carport. Both appeared in good shape, but they moved rarely, if at all. Not sure if it was a hobbyist/collector or an elderly person. Think they were still there when I moved to a different neighborhood in 2004, but gone when I drove by some time afterward. The only one I’ve seen since, that I can think of at least, is a ’72 or ’73 Monaco sedan that was parked at a repair shop here in Richmond a couple years ago. Medium brown metallic with a light tan vinyl roof, and looked to be in excellent shape. There for maybe two nights and then gone, so presumably just in for service. Those hidden-lamp Monacos may be polarizing but they’re among my favorite fuselage’s. So very 70’s over the top! 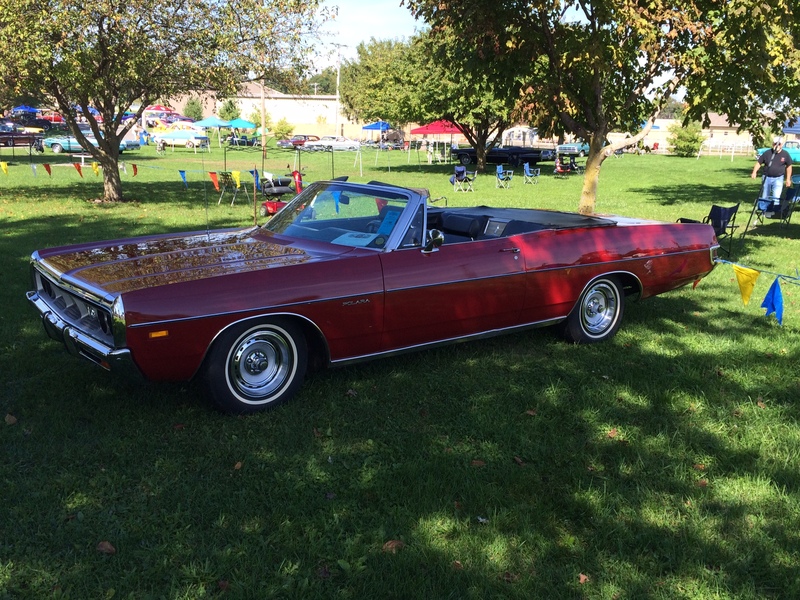 Nice to see the C-body featured…I purchased my ’69 Polara convertible at the Ducktail Run Car Show in Gas City, IN in 2005 as a retirement present to myself (had driven my ’59 Dodge Coronet from WI to the show)..had it gone over by my brother-in-law’s mechanic & picked it up a couple of weeks later. It was photographed & featured in the April 2008 issue of Collectible Automobile magazine. The picture attached is from a return trip to the Ducktail Run a couple of years ago. Those cars belong to me. I can’t tell you how many times I have been woke up by people trying to buy them. They are not for sale. I will take them to my grave. I also own both of these 71 Polaras. Also never will be sold in my lifetime. The yellow 69 is the same car just parked at my other home. Thank you for commenting! When I saw your cars a few years ago I suspected the owner knew exactly what he had. I’m glad you plan to keep them and seeing any C-body of this vintage is a treat. I would have been much more appreciative if you had approached me for an interview about my cars instead of doing this behind my back. Finding out about this several years after the fact smacks of indifference and arrogance. Your article is very comprehensive, and I do appreciate the effort you put into making the article as informed as you did, however you did take advantage of the fact that I own several of these cars, and used that unique effect for your own advantage without any recognition of my own efforts. That is selfish in my opinion. You used me for your own recognition. I would be willing to provide time to give you detailed information about my cars if you would at least give me the recognition I deserve. That is not asking for too much. This is what we do here: we take snapshots of interesting cars parked on the streets and in driveways. And then we say something relevant about them historically. This is not about you or your cars; it’s about the 1969 Polara and Monaco. And your two cars were the examples Jason found and wrote up. Most of us are two busy to go and try to contact the owners of the cars we write up. And frankly, lots of folks do not like having a stranger knocking at their door asking about their cars. As you yourself said, you’ve been “woke up by people trying to buy them”. How about being appreciative of the fact that Jason didn’t bother you? Jason didn’t in the slightest take advantage of you. He didn’t do anyhting behind your back. It wasn’t selfish in the slightest. He didn’t use you for his own recognition. You’re being quite unreasonable. I hate to say this, but your comment is rather rude. And it’s undoubtedly a good thing Jason didn’t knock on your door. I suspect it wouldn’t have been a happy meeting.